Towards the end of the 2015 season, Yankee fans got a glimpse of a long awaited prospect that was believed to be the second basemen of the future. The only real question of the 24-year-old was how his glove would translate to the Major League level. However, he managed to show promise at second and a big bat. Rob Refsnyder, the South Korean native, comes in at #6 on our top prospect list. A three sport athlete in high school, Refsnyder went on to excel in college ball as a member of the University of Arizona’s baseball team. 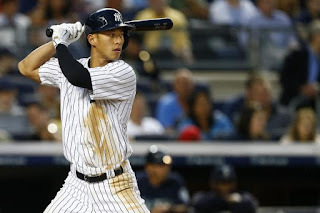 Despite not being a highly touted prospect and going undrafted in the 2009 draft, the Seoul native was eventually drafted in the 5th round of the 2012 MLB Draft by the New York Yankees. Upon being drafted, the Yankees had him make the switch from the outfield to second base. Ref’s first taste of pro ball came the same year he was drafted, where he spent a half season with Single-A Charleston. His first go at it was less than impressive as in 162 at bats he had a slash line of .214/.319/.364. After splitting time between Charleston and Tampa the following season, the Arizona product greatly improved as he hit for a line of .293/.413/.413 while driving in 57 runs in 130 games. Even though his bat heated up, his glove showed it was in need of some fine tuning as he committed 25 errors. Ref picked up where he left off in 2014 as in 228 at bats, the then 23 year old hit for an impressive line of .342/.385/.548. He demonstrated a great sense of awareness at the plate as in 244 plate appearances he walked 14 times and struck out only 38 times. Encouraging to Yankees brass, he also cut down on his errors, only committing 9. In 2015, the 24 year old spent his time in Triple-A Scranton where he collected 122 hits and 56 RBI’s in 117 games. With nothing left to prove offensively, fans were pushing for the Yankees to call him up to the bigs to replace (the beloved) Stephen Drew. The Yankees were hesitant to call him up as they felt his glove was still a major weakness, as he committed 18 errors in AAA. Fans eventually got their wish and Ref made 12 starts for the Yankees in 2015, hitting for a fantastic line of .302/.348/.512 in a small sample size. Refsnyder seemed to hold the keys to the starting gig at second base until Brian Cashman traded for Starlin Castro. With Castro now the clear cut starter at second and Didi at short, it leaves Refsnyder with few options at the major league level. One way he could sneak on the roster is backing up at second or even third base, as the Yankees are giving him reps at both positions this spring. “It’s not disappointing, If I work hard, put myself in a (good) position, I think something good will happen. Just looking forward to getting back at it.” Refsnyder said to Chad Jennings of The LoHud Yankees Blog regarding the acquisition of Castro. With the Yanks giving him a shot at a backup role, it’s clear that they still find value in his bat and presence on the roster. Refsnyder will either begin the season as a bench piece for the Yanks or Scranton’s starting second basemen. If he can’t force his way onto the Major League roster, the Yankees may look to trade him. Either way, in a clearly frustrating situation, Ref is staying positive and most importantly, working on improving his game. For a more detailed look of what the Yankees could do with Refsnyder, check out my piece HERE. You can check out all of Ref’s Minor & Major League Stats HERE. You can keep up with our full top 30 list with links to our breakdowns HERE.